﻿FIGHTER "TAPS-OUT" TO PROTECT THE HEALTH OF HIS OPPONENT﻿! This video exemplifies true professionalism. If only more corners would take this to heart and protect their fighters. Stopping fights where their fighter is getting hurt would be a true advancement in our sports. MEDICAL DECISIONS AND LABORATORY INTERPRETATIONS - Weekly questions for learning, comments and opinions. Is it better to do the weigh-in for a fighter the day before the fight or the morning of the fight? 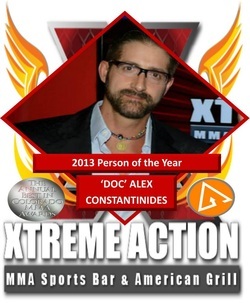 Dr. Alex Constantinides Named "2013 Person of the Year"